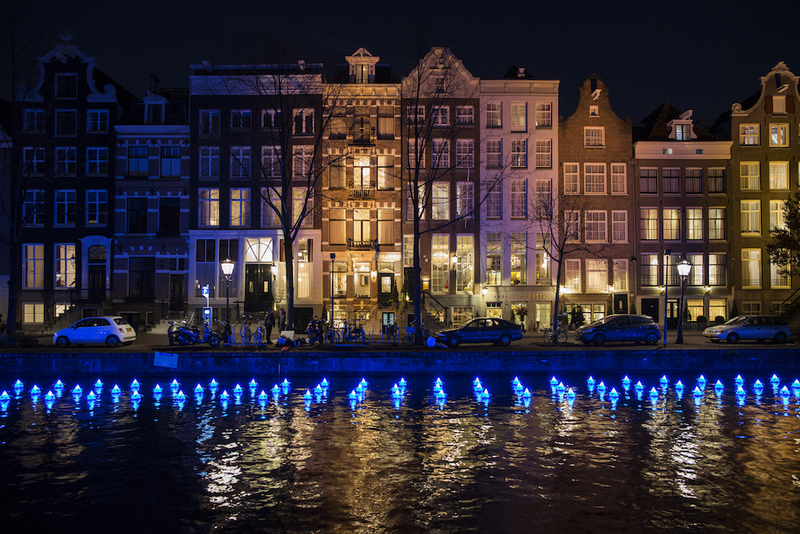 From tulips to lace, from the experimental to the spectacular, this year’s Amsterdam Light Festival involves 35 art installations across the city, giving locals and tourists a light spectacle during December and January. 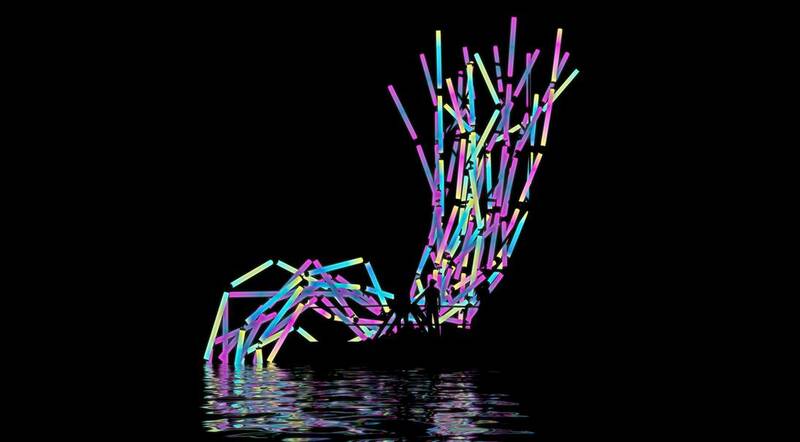 Picked from a selection of 1800 applicants, designers, architects and artists have contributed from all over the world to create light art that is innovative and designed specifically to be showcased in Amsterdam. 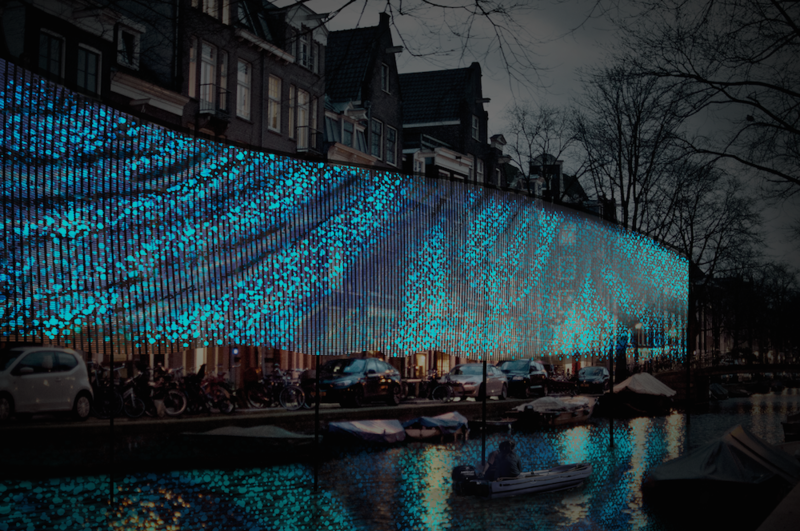 Now in its 5th year, Amsterdam Light Festival can be enjoyed by water on canal tours and on foot when the walking tour opens later this month. Laser lights have been used to show off of some of the city’s most famous buildings, while massive tulips that dazzle and change colour are among the top pieces of art that can be enjoyed while aboard canal boats in the city. Launching this year’s festival, chairman Felix Guttmann said: ‘There are three reasons for doing this festival, to give artists the chance to showcase the most innovative in light artistry, to make the dark winter months more bearable with light and to make Amsterdam attractive to visitors in the winter. Rogier van der Heide, who is in his final year of working as artistic director of the festival, added: ‘Within the first hour of opening up applications we had 500 applicants and nearly 2000 in total. It is a global platform for the progression of light art that is attractive to artists across the world. ‘Our exhibits on the water route are large and vivid and monumental and were chosen by an international panel of judges. 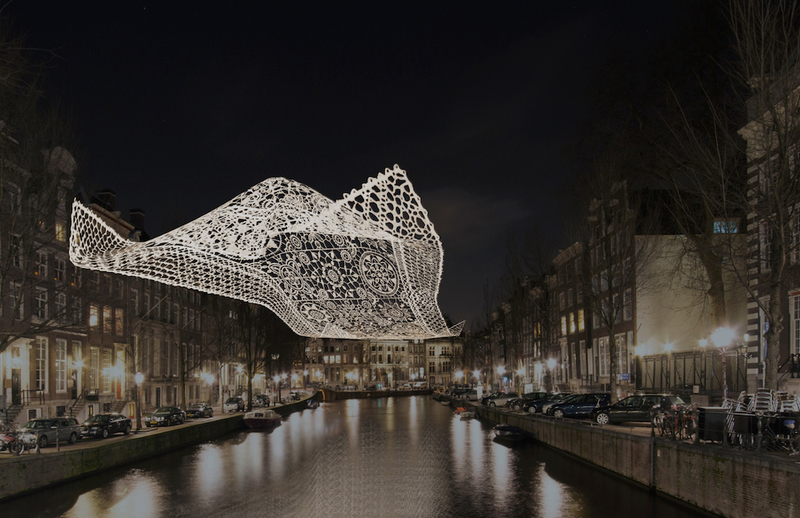 Described as the ‘jewel in the crown’ of the festival, The Lace was designed to echo the shape of traditional Dutch bonnets and is made of special reflective material to glow as it is suspended over the Herengracht near the Royal Palace. The piece was created by Massachusetts based architects Choi+Shine. Creative teams revealed that they had been working on the project for over a year before it came to fruition and was unveiled to the public. Light Waves, designed by Benthem Crouwel Architects and Jólan van der Wiel reflects 3,000 LED lights that change and move according to movement and changes in weather. Francine van den Berg from Bentham Crouwel Architects, said: ‘We have been working on this since 2015 and are so excited to see the result tonight. Many more of our team will also come to see the art being realised on the water. Visitors can explore the light spectacle by boat from December 1 2016 to January 22. Walking tours will be launched on December 15.